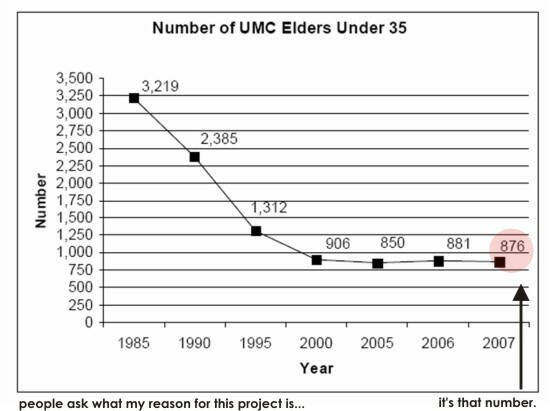 Time for an update on this UMC Young Clergy project. My school is working to give me elective credit which is great. I do work study for our IT department and from the minute I mentioned this idea, they told me to drop the other things I do for them and work almost 100% on this. Meg Lassiat at GBHEM (ordination, young adults, etc.) is interested in supporting this project. I can’t wait to meet with her and others in Nashville to see how to get this in the hands of lots of people. The overall project has developed into two sections. I’ve put out the call to the over 200 young clergy that signed up on Facebook to submit photos and videos. I want to publish a photo essay book that has photos answering the statement “I want to be a pastor because ______.” I also want to include “a day in the life of a young pastor.” I hope high school and college students will get this book and really SEE themselves as a pastor. One reason we have a young clergy shortage is because many churches stopped voicing a possible call in youth. Adam Hamilton at Church of the Resurrection mentioned they get their 150 7th grade confirmands together and ask them to point to others who might be a good pastor. Then anyone who might be interested fills out a card and they’re trained as they grow up. By high school, they’re speaking and doing visitation. They have a goal to send out 200 people for ministry in the next 5 years. The second part of the project will be the documentary. I’m overwhelmed with all the great footage as I try to wade through it. I’m starting to see a story emerge that will be fun to convey. I need a 2-3 minute preview done by next Wednesday to show our Board of Trustees. So hopefully you’ll see something soon. 🙂 Well, if I can ignore my computer long enough to finish an exegesis essay for Dr. Watson! good luck. if you in nashville i’d love to meet up to help discuss how i might be able to help spread the word. not to be critical, but the general agencies are not the best at communicating.. especially to the younger folks.. and they are my friends and they would agree with me. I work with Meg Lassiat at GBHEM and we are really working hard to do some good things with and for Young Clergy. I’m currently in D.C. at the Young Adult Seminarians Network’s National Gathering. We have workshops led by, among others, Carol Merritt (Tribal Church), Lovett Weems (Crisis of Younger Clergy), and Jim and Debbie Bushfield (Things They Never Taught You in Seminary.) We have been collaberating with GBCS and GCRR on a day long immersion trip about the racism of mascots (think Washington NFL team). GBHEM has recently redesigned their website (www.gbhem.org), so we are making progress. Meg has convened a “Best Practices” group for recruiting young clergy (report available at http://www.explorecalling.org), and a “National Leadership Development Advisory Team” working to resource annual conferences as they encourage young leadership. I’m encouraged by what our agency is doing to identify the problem, identify solutions already working, and communicating those to our constituencies. We look forward to working with Jenny on her project.